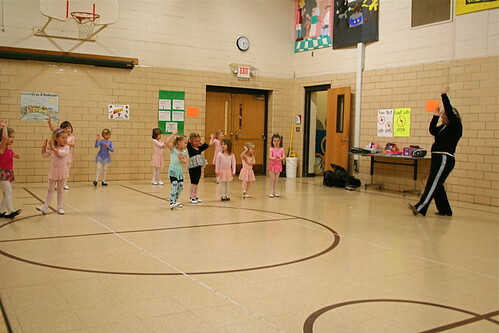 Bella takes a little dance class once a week at the local elementary school and last night was the highly anticipated PARENT WATCH NIGHT! My first thought upon waking on Tuesday was that I needed to prepare the cameras. Because as usual, it is ALL ABOUT THE PICTURES. Here she is waiting for class to begin. Right after this picture the girl next to her gave her a big hug. How cute are 3-year-olds? Bella is the little short one all in powder pink, with the handknit legwarmers. Meticulously following the teacher. But you knew that. Now it's time for a mid-class shoe change. Something the teacher normally does without the help of parents. How does she do that? 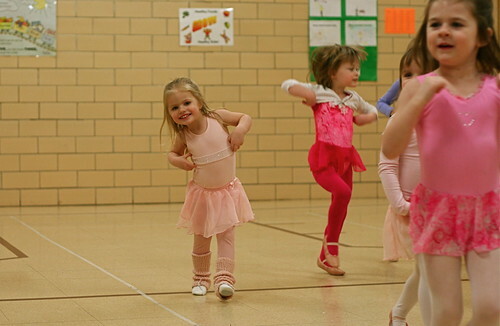 Off with the tap, on with ballet. 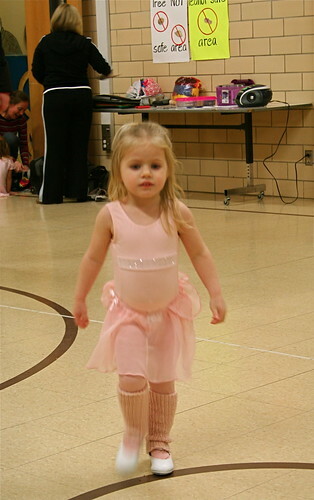 And for the ballet part of the night, she got to be a monkey. At least I think that is what she is doing in the picture. Maybe it is a chicken. And waving to us at the end, so proud of herself. We are the only parents still sprawled on the gym floor taking pictures. At the end all the girls get stamps on their hands. Bella got a princess and an ice cream cone. And if you give a kid an ice cream cone stamp.... she's going to want an ice cream cone to go with it. So she ended up at Culver's to cap off the evening. 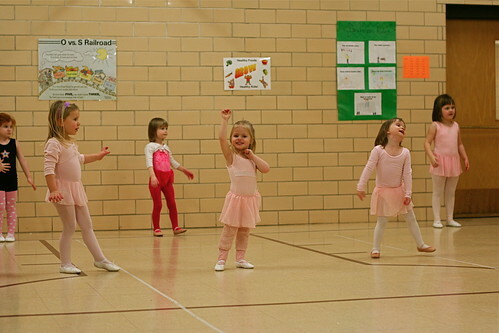 Because we are powerless to the cuteness of a tiny pink ballerina. In other news, I ran out of yarn for my green Fred Textured baby sweater and had to order more (since I bought it in Rochester) just to do the collar, which is like 8 rows of garter stitch. Damn. I am filling the waiting time by grumpily knitting another toadstool baby rattle. I might have accelerated Spooky's end, the senior citizen bunny, by taking him to the vet--since now he appears to have a virus or something. Brent has promised to setup Bunny Nursing Home Webcam so I can check him while at work. If only he could twitter! "Fallen. Can't get up. Need apples." about 30 seconds ago from web. Love the pictures! Thanks for sharing.